Clearline Aligners are comfortable, have little effect on speech, and are nearly invisible. The trays are easily removed for eating, and brushing. Online case management allows for submitting of digital cases, reviewing and approving treatment designs, and revising and communicating on treatment. Clearline is an Orthodontic System for the Cosmetic Correction of Misaligned Teeth in crowded cases. A series of progressive treatment set-ups are created, and hand-crafted clear aligners are fabricated. The impressions of the mouth are sequence, and thin thermoplastic polyurethane trays are formed. Seating the series of aligners applies light pressure for dental movement and correction. Alligners are worn 22 hours per day and removed only for eating and brushing. Each stage of treatment consists of a series of up to 6 aligners to be used for a period of 2 weeks each. There may be as many as 4 stages of treatment. Staging allows for IPR coordinating and scheduling, and tracking and monitoring progress. Treatment time can take 6-18 months. While case selection is critical to successful treatment, many types of tooth movements are possible with clear aligners. Ideal aligner cases are those that require moderate alignment and rotations. Factors such as available space, retention and anchorage, and patient compliance all play a critical role in achieving final results. IPR or interdental stripping may be incorporated into treatment to resolve crowding or interferences. Diamond strips or a slow speed diamond disk are used to slenderize teeth and reduce interproximal enamel to create space and allow for realignment of teeth. The exact amount and locations of required IPR will be specified in the Interproximal Reduction Guide. Diamond strips and the IPR measurement guage are available at the Protec Store www.protecdental.com/store. Attachments designed in selected geometric shapes may be bonded to the teeth to aid in anchorage. These composite attachments act as “tooth handles” and allow the aligner material to grip tooth and apply rotation, extrusion and intrusion, and retention and anchorage type forces. Attachments will be applied to pre-treatment models and reflected in the indirect tray for bonding to the teeth at the 2nd appointment. The active treatment phase is followed by retention. It is essential that the orthodontic alignment and correction is held and maintained with indefinite retention. CLEARLINE RETAINER- the thin, clear polyurethane material is pressure-formed over the dentition to retain teeth without labial wires. V-LOOP RETAINER- this light wire is adapated to the lingual of the anterior teeth and luted to precisely retain dental alignment. CLEARBOW RETAINER- a clear plastic strap is designed to provide superior esthetics and maximum tooth contact. 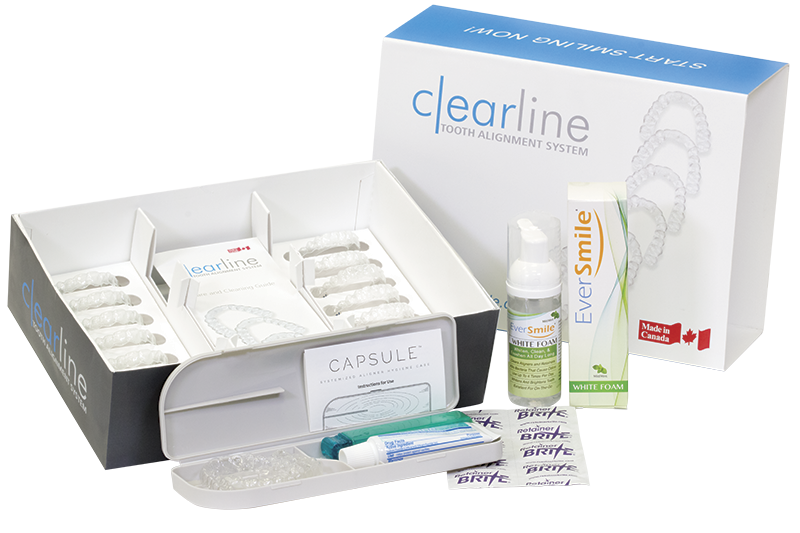 The Clearline treatment package comes complete with aligners, instructions, and a cleaning and storage kit.